Submissions to the AAS journals should be directed to one of the topical corridors, described below. Each corridor is managed by a different Lead Editor, and with a few minor exceptions, these corridors have been chosen to match existing IAU divisions. As it is inevitable that some submissions will fall near the boundaries of these corridors, the authors should choose the corridor that they believe best reflects the emphasis of the submission. The Lead Editors reserve the right to redirect manuscripts they feel would be better suited to a different submission corridor. The AAS journal corridors do not uniquely define the division of subject material between The Astrophysical Journal and The Astronomical Journal. The corridor descriptions below include a brief explanation of which topics will be directed to each journal within the corridor. If authors wish to indicate a journal preference that does not correspond to these descriptions, they will have the opportunity to do so during the submission process. If necessary, they can add a justification for that choice to their cover letter. Authors of relatively short articles of unusual significance and broad interest should select The Astrophysical Journal Letters at manuscript submission. 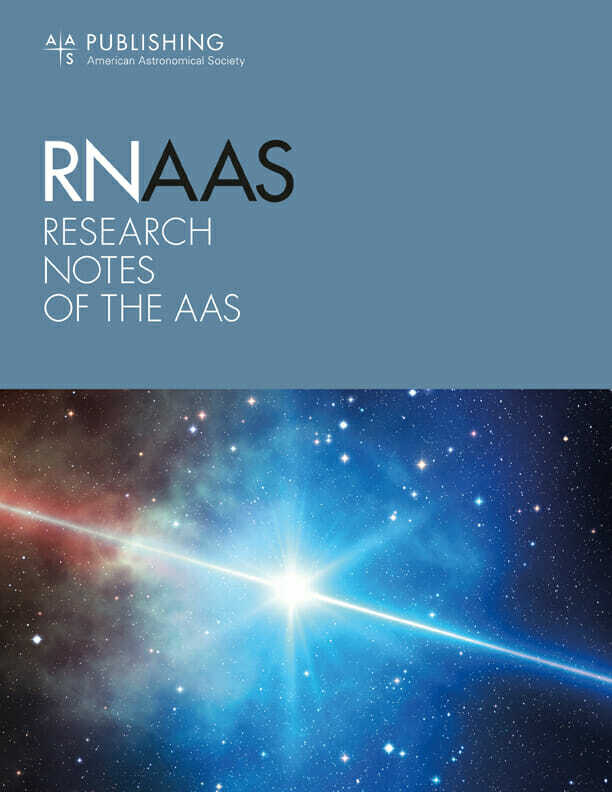 The Research Notes of the AAS is a new venue for authors to promptly and briefly share materials of interest with the astronomical community; submissions were first accepted in October 2017. This corridor includes most topics relating to galaxies and cosmology from within the Local Group to the very early universe. This includes: early universe physics, dark matter, dark energy, cosmological models, cosmological parameters (e.g. the Hubble constant, etc.) the cosmic microwave and other diffuse backgrounds, galaxy and structure formation and evolution, stellar populations and the evolution of galaxies, physics and observations of galaxies and galaxy clusters, the intergalactic medium and reionization, and large surveys of the universe. Active galactic nuclei (AGN) may be included here (although some aspects of AGN will also appear in the High Energy Phenomena and Fundamental Physics corridor). Articles about the internal dynamics of galaxies go to this corridor. Articles that use objects, such as supernovae, primarily as tools to study the universe as a whole should also be submitted to this corridor. Accepted articles submitted to this corridor will be published in ApJ if they have significant theoretical or astrophysical content, AJ if they are primarily observational, or ApJ Supplements if they are devoted to the description of large data sets with little theoretical interpretation. Christopher Conselice is a Full Professor of Astrophysics at the University of Nottingham, where he has been since 2005. Christopher is an expert on the properties and evolution of galaxies, and he has worked on and studied galaxies from the local universe all the way back to the first galaxies. Before Nottingham he was a National Science Foundation Postdoctoral Fellow at Caltech, and he completed his PhD at the University of Wisconsin-Madison and at the Space Telescope Science Institute. Christopher won the Leverhulme Prize in 2009 for his research, which is lately focused on the formation of the first galaxies back to the epic of reionization and preparing for JWST and the Euclid Space Telescope. This corridor includes the physics and observations of collapsed objects (neutron stars and black holes), processes that produce high energy photons and particles (including cosmic rays) either by themselves or as part of a broad spectrum of emission, the physics of ionized accretion disks and jets, and theoretical and observational studies of supernovae. (Supernovae as tools to study cosmology would normally go in the first corridor.) Other relevant topics include plasma astrophysics, magnetohydrodynamics, shocks, particle acceleration, photoionization, jets, high energy outflows, bursts, extreme gravity, strong magnetic fields, etc. Accepted manuscripts submitted to this corridor will usually be published in ApJ. Frank Timmes has been an editor for the AAS journals since 2009. His research interests span many different areas, including supernovae, cosmic chemical evolution, astrobiology, gamma-ray astronomy, and high-performance computing. In 2015 Frank was awarded the Simons Fellows Award in Theoretical Physics, and his articles are regularly among the most cited in astronomy and astrophysics. This corridor includes articles on the properties of stars of all masses and evolutionary stages and the physical mechanisms that govern them. This covers a broad range of aspects, including the determination of stellar observable properties and their time variability with all possible observational techniques, the investigation of their atmospheric and internal constitution, stellar winds and outflows, the theoretical modeling of stellar formation, structure, and evolution, the techniques used to measure and classify stars such as spectroscopy, radial velocities and photometry, and the production of stellar predictions (e.g. stellar evolution tracks, lifetimes, chemical yields, star-planet interactions, etc) used by the astronomical community at large. Manuscripts on young stars should be submitted here, but those on protostellar disks and the environments around young or forming stars, either theoretical or observational, should be submitted to the Interstellar Matter and the Local Universe corridor. Accepted manuscripts in this corridor may be published in either AJ or ApJ, depending on whether the emphasis is on stellar physics or on observational parameters of particular stars or systems. Articles consisting of catalogs of stellar properties, with relatively little interpretation, may be published in ApJ Supplements. Steve Kawaler usually tackles the interior structure and evolution of stars, although he has also flexed his detective muscles as part of the team that solved the mystery of the VJ Day kiss. This corridor includes articles on exoplanets and solar system objects, including moons and minor bodies. Topics would include the physics of planet formation, and the dynamics of planetary systems, including celestial mechanics. (This last is found in IAU Division A, which is not represented by its own corridor here.) Manuscripts relevant to astrobiology should be submitted to this corridor. As in the previous category, the division between AJ and ApJ primarily depends on whether the content is primarily observational or theoretical. However, following a longstanding tradition, articles in celestial mechanics are typically published in AJ. Articles in astrobiology will normally be published in AJ. Michael Endl obtained a masters and PhD degree in Astronomy from the University of Vienna. For his PhD thesis he received a graduate student fellowship by the European Southern Observatory. As part of his thesis work he helped to discover the first exoplanet, a Jupiter-type planet, in the habitable zone of a Sun-like star. After the completion of this doctoral degree he joined the University of Texas at Austin. He is now a Senior Research Scientist and Lecturer at UT. His main scientific interest are the detection and characterization of potentially habitable planets that we might be able to search for bio-signatures in the near future. This corridor includes articles on the interstellar medium (ISM) and the stars in our Milky Way and in nearby galaxies (out to ~15 Mpc). The ISM and stars, the two major visible components of a galaxy, are coupled to each other through star formation, stellar feedback and their gravitational potential. Topics range from detailed studies of the physics and chemistry of different components of the ISM (ionized, neutral, molecular), both locally and on galaxy-wide scales, to measurements of resolved stellar populations and star clusters in the Local Universe and the dynamics of galaxies. The formation and evolution of atoms, molecules, and dust during all phases of star formation and death are an integral part of ISM studies. Finally, this corridor includes studies of debris disks and protoplanetary disks. Articles on the ISM, dust, those related to star formation, and laboratory astrophysics relevant to molecules, atoms, and dust particles will be published in ApJ. Data-intensive articles will be published in AJ. Articles that consist of compilations of observational data with relatively little theoretical interpretation can be published in ApJ Supplements. Judith Pipher’s primary research is in the area of infrared astronomy and infrared-detector-array development. With Professor William J. Forrest, she developed over a 20 year period sensitive InSb arrays for the Spitzer Space Telescope infrared array camera, launched in August 2003. Currently their group is developing longer-wavelength arrays that can be passively cooled for space missions. Her scientific emphasis has been the study of star-forming regions. Judith was inducted into the National Women’s Hall of Fame in 2007 for her work in infrared-detector-array development for astronomy. She has been an editor of The Astrophysical Journal since 2002, and has served on the Board of Trustees of USRA – the Universities Space Research Association – since April 2011; Judith is currently Vice President of the Board. This corridor includes everything having to do with the Sun, its internal structure and dynamics, the solar wind out to the heliopause, and the interaction between the solar wind and the ISM. Manuscripts accepted through this corridor will be published in ApJ or ApJ Supplements. Leon Golub is Senior Astrophysicist in the High Energy Division at the Harvard-Smithsonian Center for Astrophysics. He specializes in studies of solar and stellar magnetic activity, and has built numerous rocket and satellite instruments to study the Sun and its dynamic behavior. He has published two books in this field, The Solar Corona and Nearest Star: The Surprising Science of our Sun, both with Jay M. Pasachoff. This corridor includes articles on instrumentation, astronomical software and computing, large databases, as well as methodological studies that are not strongly tied to a particular subject category already listed above. Laboratory experiments aimed at understanding astrophysical phenomena (“Laboratory Astrophysics”) is also part of this category (shared with ISM and the Local Universe). Authors should also consult the newly revised AAS policy on Software. Accepted manuscripts in this category will be normally be published in AJ, but when appropriate (e.g. software for cosmology) the corridor also feeds into ApJ. Chris Lintott is a Professor of Astrophysics at the University of Oxford, where he is also a Research Fellow at New College. As Principal Investigator of the Zooniverse, he leads a team that runs the world’s most successful citizen-science projects, including Galaxy Zoo and Planet Hunters, work for which he was awarded the AAS’s Tinsley Prize. His own research focuses on problems of galaxy formation, and on resolving the data problems presented by the next generation of astronomical surveys. He is part of the “brains trust” behind the .Astronomy series of conferences, which bring together those using the web for astronomical research and outreach. A passionate advocate of the public understanding of science, he is the Co-presenter of the BBC’s long running Sky at Night program and the author, with Queen guitarist Brian May and Sir Patrick Moore, of two books, both available in more than 13 languages.